Since sphalerite is a relatively soft stone, with a hardness of only 3.5 to 4 on the Mohs scale, it is not suitable for rings. It can be used in pendants if set carefully. But it is mainly a gem for the rare stone collector. Gemologically, sphalerite forms as cubic crystals, like diamond, and has perfect cleavage in six directions. It has a refractive index of 2.368 to 2.371, just slightly less than diamond, and higher than demantoid garnet, sphene, zircon and corundum. It is one of the few gems with an admantine or diamond-like luster. But it is sphalerite's dispersion or fire that is truly unique -- it has a dispersion rating of 0.156, significantly higher than demantoid garnet (0.057), sphene (0.051) and diamond (0.044). Sphalerite has a density or specific gravity of 3.9 to 4.1, about the same as sapphire. This month we feature new acquisitions to our collection. Click on a photo to see the details for the item. A gorgeous pink-red Mahenge spinel in a rare large size! This extraordinary gem has excellent clarity, fine cutting and wonderful briliance. Certified by GemResearch Swisslab (GRS) as natural and untreated, with the color graded as "pinkish-red". A superb gem with the neon glow characteristic of the rare spinel from Mahenge, Tanzania. A fully saturated fine Ceylon royal blue sapphire. This stone was precision cut with excellent polish. Certified by GemResearch Swisslab (GRS) with the color graded as "vivid blue (GRS type "royal blue")." A special gem that will surely make a beautiful piece of jewelry for someone special. An outstanding large sphalerite from the Aliva mine in northern Spain. This gorgeous round sphalerite is over 14 mm in diameter and is amazingly bright and fiery, with flashes of orange, yellow and green as it is turned in the light. Beautifully cut and very clean, this is a superb gem sphalerite for your collection. Guaranteed natural and untreated. An impressively large gem scapolite from Tanzania! Completely clean, this fine material has been precision cut to produce a dazzling gem with superb luster. This will set up beautifully in a cocktail ring or pendant, or as a fine addition to your gem collection. Guaranteed natural and untreated. A very fine Burmese ruby with outstanding color and clarity. Fine Burmese rubies over 2 carats are now extremely rare. This gem is a deep saturated red and is beautifully cut to maximize brilliance. The clarity of this material is simply wonderful for ruby, and we have graded this gem "almost loupe clean". Certified as "pigeon's blood red" by GRS. This is a gem that you will enjoy for years and your family will treasure for generations. Barite (or Baryte) is a barium sulfate mineral that is not commonly found cut as gemstones. It has a hardness of 3-3.5 on the Mohs scale. This impressively large Barite has been precision cut and will make a fine addition to a gem collection. Guaranteed natural and untreated. Henry David Hope was a banker and gem collector who died in 1839. He is best known for the Hope Diamond, a 45.52 carat deep blue diamond (now in the collection of the Natural History Museum in Washington, D.C.). 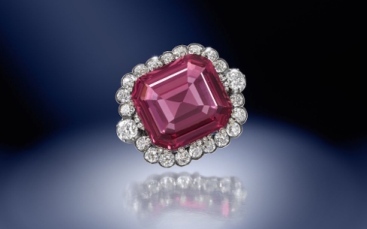 Among the important stones in his 700 piece collection was a 50.13 ct spinel, known as the Hope Spinel. This rare large spinel last appeared at auction at Christie's in 1917. The gem sold at Bonhams London auction on Sept. 24 for $1.5 million, setting a new auction record price per carat for spinel. In January 2014 Petra Diamonds announced the discovery of a 29.62 carat blue rough diamond at their Cullinan mine in South Africa. They have now cut a 12.03 carat cushion diamond from the stone, which they are calling the "Blue Moon" Diamond. GIA has graded the stone as "Fancy Vivid Blue", the highest color grade for blue diamonds, with a clarity of IF. Sotheby's will offer the gem at auction in Geneva on November 11, with a pre-sale estimate of $35 to $55 million. All gemstones are rare, since they constitute a tiny percentage of the minerals found on earth. But some gemstones varieties are extremely rare, insofar as only a small number of gem-quality specimens are known to exist. They include rare species such as painite, taaffeite, grandidierite, jeremejevite, poudretteite and benitoite, as well as very rare colors of more common gems such as red diamond and red beryl. For more information, see our article on the Rarest Gemstones in the World. Quartz is indeed one of the most common minerals, but it is not the most abundant. The feldspars are the most common mineral in the earth's crust, comprising about 60% of all igneous rocks. Plagioclase feldspar gemstones include moonstone, sunstone, oligoclase, orthoclase, labradorite, andesine and amazonite. If we consider the earth's mantle -- much thicker than the earth's crust -- the most common mineral is olivine, a magnesium iron silicate. Gem quality specimens are known as peridot. There are several olivine minerals, including wadsleyite, ringwoodite and bridgmanite. Bridgmanite, which is found in the lower mantle at depths between 670 and 2,900 kms is, according to geologists, the most abundant mineral in the world.